Thank you everyone for all your encouragement and support these past few months! I finished the half marathon with a time of 01:34:17. A personal best! It was such a beautiful day this past Sunday with clear skies and warm weather. Perfect running conditions! I joined the half-marathon with World Vision to help raise money to fight against child trafficking around the world. As a team, World Vision has raised over $75,000! Here’s a photo of me celebrating at the end of the race with an Apple Bacon Fritter from Lucky’s Donuts. It’s apple, bacon, topped with a maple glaze and even more bacon. It was exactly what I needed after running a half marathon! Phebe and I drove down to the States for an overnight trip during spring break. We stopped by Seattle Premium Outlets in Tulalip for a little shopping. I found out that if you show your Canadian passport to the retailer you can get a discount from your purchases. I ended up getting some dress shirts and running shorts which were on sale. For dinner we sent to this Greek place near Marysville where we had delicious gyros. We then drove to Everett where we stayed overnight at a hotel. The next day, we explored the little down of Everett but there was not much to see. In the afternoon, we drove to Skagit Valley to visit Tulip Town. It was nice and relaxing to walk around the tulip fields and seeing all the different colored tulips. Later in the afternoon, we went to Bellis Fair Mall in Bellingham where we did some more shopping and had a buffet dinner at the Old Country Buffet. After dinner we went back home and had the shortest border crossing ever. I think we waited for maybe two minutes and then we were back in Canada. Overall, great relaxing trip. My friend Steve and I had been planning to meet up for quite some time and do a hike together. 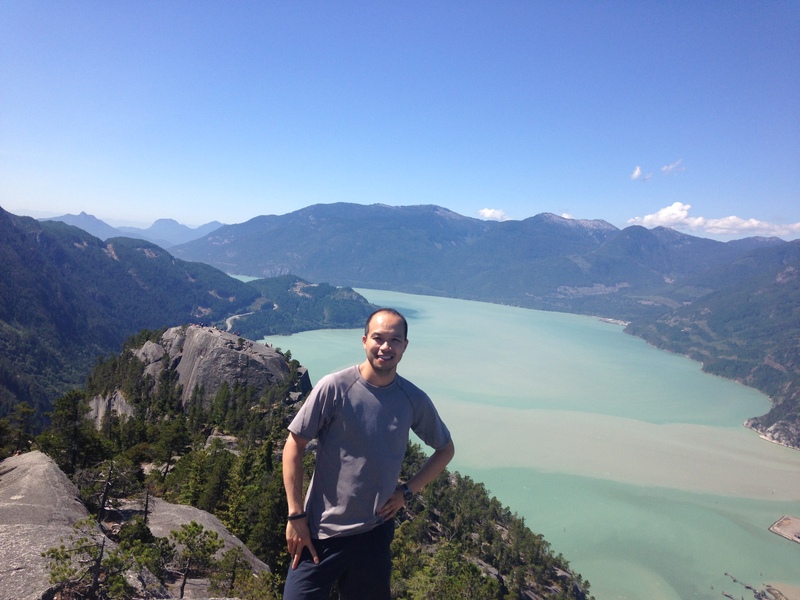 He lives in Kelowna and I live in Vancouver and so we decided to meet halfway near the Coquihalla Recreation Summit Area which was both a two hour drive for us. Perfect! After some online research, we decided on Needle Peak as it seemed to be the most difficult hike. Some of the posts said it would take around 7-13 hours of extreme hiking. The forecast for that day called for reasonable weather, about a 20% chance of rain. However, Steve and I were both unprepared to what we had in store that day. During the middle of the afternoon, it had actually snowed on us! Luckily I brought some pants, but I wished I brought a pair of gloves and a toque! We left the trailhead around 9am and arrived at the top of the peak in about 2 hours. The elevation at the top was about 2000m. We were probably at the top for a good hour or so since we wanted to wait until the clouds cleared up to take our signature “Buddha” picture. So we had our lunch there and waited for the clouds to disappear. By then other people started to come to the top and it got a bit crowded. Since we got to the top earlier than we had intended, we had the rest of the day to ourselves and decided to explore the area. We went to an area called Flat Irons and that’s when the weather turned on us. The fog and snow came in and the cold was almost unbearable. We hiked about a total of 24kms in total that day. We wanted to celebrate with a big meal at the end of the hike but the only thing that we thought was open was an Indian food truck near the Coquihalla Recreation Summit parking lot but it was closed. So left our separate ways until our next conquering adventure! 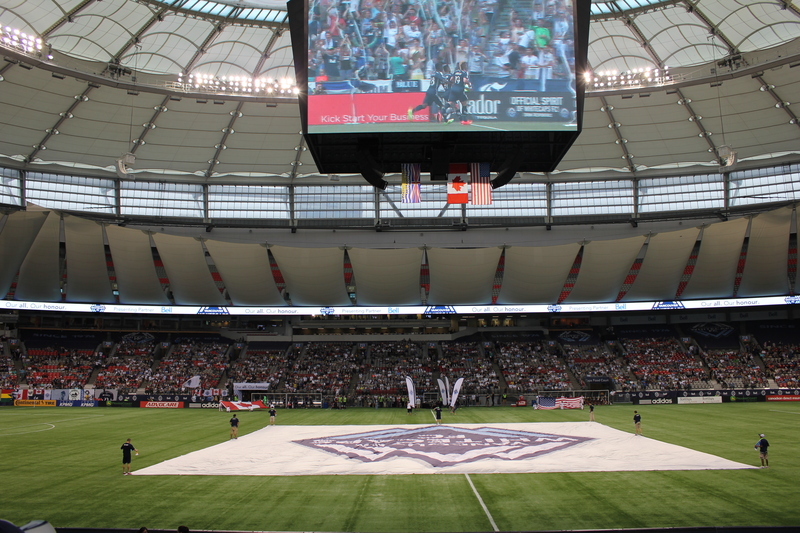 This was my very first Whitecaps game! 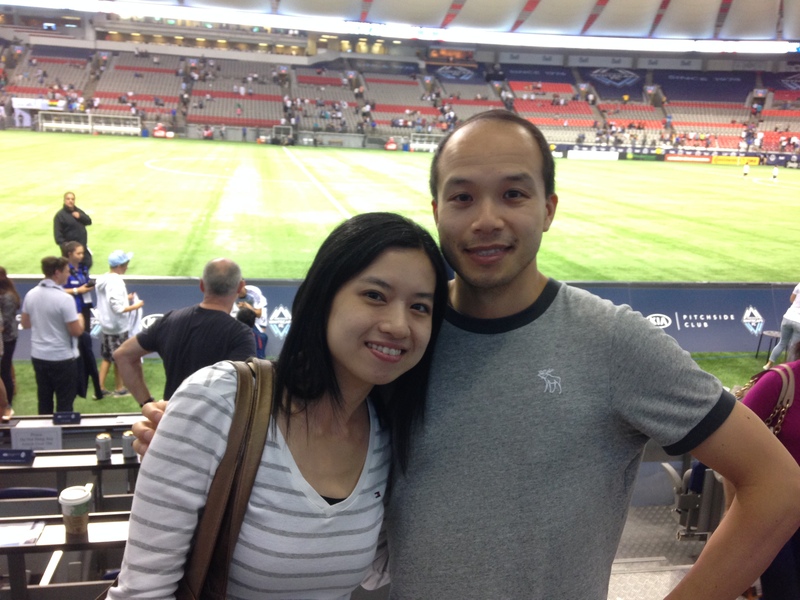 I won these tickets earlier this year while attending a World Vision fundraiser for the BMO half-marathon. We had pretty good seats sitting right in the middle of the action. There was a section in the crowd that was loud almost the entire game. They kept chanting and playing the drums the whole game. It made for a good atmosphere. 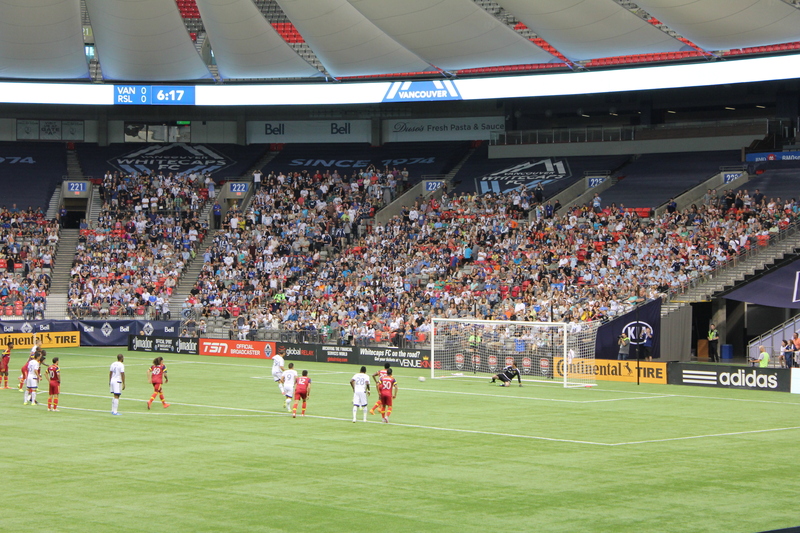 The Whitecaps dominated Real Salt Lake the entire game and won 4-0. The funniest parts of the evening was when the announcer would annouce the person who scored the goal by saying the player’s first name three times and allowing the crowd to say the players last name three times. At the end, the annoucer would say “Thank-you”, and the crowd would respond by saying “You’re welcome”. This hike was one of the things on my bucket list this year. Joining me on this hike was Phebe and her dad. We arrived to the Shannon Falls parking lot around 9:30am and started the Stawamus Chief hike around 10:00am since we stayed around the falls to take pictures. Our hike from the parking lot to the 3rd peak took us about three hours including our breaks. We stopped briefly on the 2nd peak for a quick break before eating lunch on the 3rd peak. We didn’t go to the 1st peak due to the huge crowds. The views on top of the 2nd peak were quite amazing. We took the back route for the hike down which took us a little over two hours. 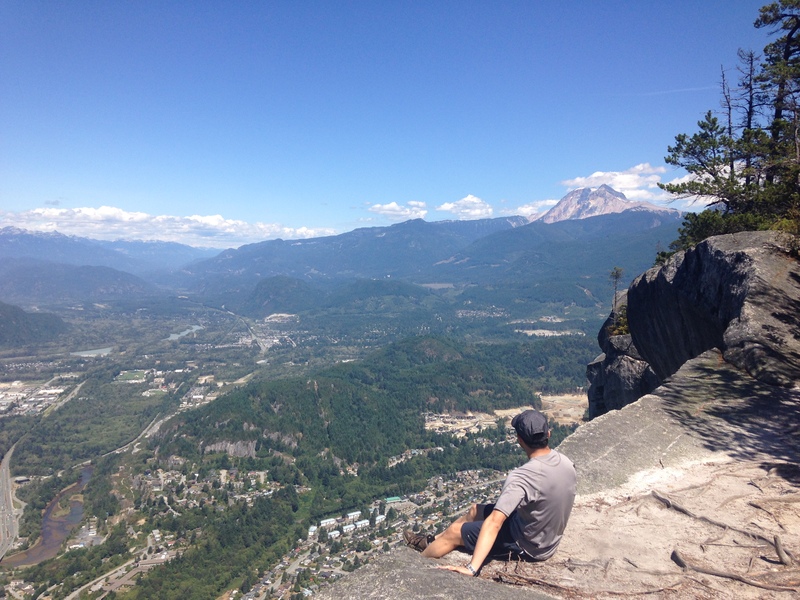 Stawamus Chief…conquered! Our United Airlines flight arrived late in the evening in Cancun. We couldn’t find any buses from the airport to the city so we haggled a taxi to our hotel. We stayed in Cancun for only two nights. We found a great food stall place near our hotel that we kept coming back to as they had fresh delicious tacos. Our next destination was the beautiful island of Isla Mujeres. We booked a snorkelling tour that included seeing the underground museum of statues, lunch buffet on a private beach and open bar on the catamaran boat (aka party boat) that took us to the island. The most annoying part of the boat ride was the pumping loud music which I thought took away from the enjoyment of the nature around us but I guess all the other tourists didn’t seem to mind. We stayed on the small island a few nights. We found a cool little restaurant for dinner called Ruben’s and tried their fish and it was amazing. The island has one of the best sandy beaches, Playa Norte. We also noticed great artistic abilities from a few unique murals on the island. (add picture?) Our time on the island was mainly spent relaxing on the beach and walking around the main centre of the island. After Isla Mujeres, we went back to Cancun and took a collectivo bus to Playa Del Carmen. We arrived late in the evening and were hungry. We researched places to eat but they were a bit of a walk from our hotel. We walked for a bit and came across this local “hole-in-the-wall” restaurant. The people in the restaurant spoke no English and there were no English menus. We were relying heavily on our Spanish Lonely Planet phrase book which was quite the adventure. By this point, I was a bit tired of eating tacos so I wanted to try something different. I pointed to the waiter/cook (I think she was the same person) the item that I wanted to eat. It sounded good even though I didn’t really know what it was except it was something chicken. Phebe also did the same thing. The food came out and it was one of the best hearty meals we’ve ever eaten. They also served gigantic fruit smoothies. The rest of the time spent in Playa Del Carmen was walking along the touristy 5th Ave, strolling along the beach, taking a dip in the swimming pool at our hotel, and a day trip to Xcaret theme park. Xcaret is an eco-archaeological theme park where you can enjoy swimming in the underground rivers, take a snorkelling tour, and swim with the dolphins. We decided just to swim in the underground rivers as this was the most popular choice. The experience was incredible. It was so good that we did it twice. The water was super cold but also refreshing as the weather was so hot. The underground river from beginning to the end is about a 40 minute swim. After the second trip we were dead tired. We replenished our energy by having a seafood buffet lunch that included everything you could image. After lunch, we explored the aquarium which included giant turtles, sting rays, lots of exotic fishes, and whale sharks among other things. Later on, we saw an equestrian horse show which was fun to watch as they did a lot of stunts with the horses. In the evening, there was a presentation called “Xcaret Mexico Espectacular”, which is a celebration of light and colour with over 300 artists that takes you through the history of Mexico. The show was amazing and very well done. This was definitely one of the highlights of our trip. It was interesting to see the history of Mexico through song and dance. Another highlight of our trip was exploring the ruins of Chichen Itza, now included as one of the 7 wonders of the new world. We booked a tour that included swimming in a Cenote, lunch buffet, and exploring the little town of Valladolid. One of the main drawbacks to seeing Chichen Itza is that you have to share it with thousands of other people. Another thing I noticed during this tour was that Mexicans will want to try and sell you anything at any time of day. For example, one of the stops along the tour was this jewellery stand. It was one of those typical jewellery stands – “once you’ve seen one, you’ve seen them all”. In addition to all the jewellery stand, another thing for purchase is a painting with your name on it with a history of each letter. Moreover, on the bus ride, we were offered to purchase a tequila bottle with our picture on it, biodegradable sunscreen, and other “junk”. Even on the grounds of Chichen Itza, choruses of local merchandisers (you mean merchants?) saying “one dollar, one dollar” never stops. One of the interesting parts of the tour was seeing the sacred cenote, aka “well of sacrifice”. This was where the Mayans would sacrifice objects and human beings in the cenote as a form of worship. Our last few days in Mexico were spent in Tulum. The hotel that we stayed at was within walking distance to the Tulum Ruins which was very convenient. What sets these ruins apart from other Mayan ruins is that it is well preserved and is situated along the beach coast. They forgot to mention that the ruins are home to a whole bunch of iguanas roaming around. No, I didn’t try to mount any! For all pictures from our Pender Island Trip, click Pender Island. Alas! The weekend we were eagerly anticipating for! We arrived Pender Island late Friday evening around 10:00pm due to the ferry being late. The cottage that we booked was conveniently located in a secluded area on South Pender Island next to the National Park Reserve trail to Mt. Norman. We were ecstatic on the place that we were going to stay for the weekend. It was clean, spacious, and was equipped with everything that we needed. It even has a hot tub! It was a bit hard to sleep due to all the excitement but we all managed to get some shut-eye. Since we arrived late last night, we had no idea what kind of ocean views our place had but when we woke up that morning, we were amazed! We each took turns making meals for the weekend. It was my turn to make the breakfast meal and so I decided to make waffles, bacon, turkey sausage, scrambled eggs, and assorted fruit. A good way to start the weekend! After breakfast, we went to the Farmer’s Market at the Community Hall and then took a stroll around Hope Bay where we spotted a bald eagle. We went back to our cottage for lunch where Phebe made delicious ground beef wraps with all the fixings and a black bean and quinoa salad. I ate so much that I almost passed out. It was that good. After lunch we just lounged around and relaxed. As Patrick was trying to gather his ingredients for tonight’s dinner, he asked if anyone had seen the watermelon that he had brought to Pender as it was nowhere to be found. Patrick thought that his wife and the rest of us were playing a prank on him by hiding the watermelon but that was not the case. Patrick desperately rummaged around the cottage trying to see if the watermelon was even there as he remembered packing it and putting in the car. I know this is silly but he even looked inside the washer and dryer! He must’ve have felt pretty foolish that he even looked there! He finally recalled that as he was unpacking all the items and bags from the trunk of his car that he heard a little ‘thud’ but didn’t think nothing of it and thought maybe there was something moving in the bushes. The car was parked on a unpaved driveway on a slight hill. So it was possible that the watermelon somehow dropped while unpacking and rolled down the hill! Our first thought was that even if it did drop that it would just splatter on the ground. However, if it did drop, it wouldn’t have rolled too far. So we begin looking around the bushes around the car. We found nothing. We went back into the cottage a second time to look but no luck. The last option was that it might have rolled all the way to the entrance of the driveway, in which case it would’ve made a slight left turn around the bend! We thought that there was no way a watermelon would roll down the hill and make a sharp bend to the left. But it was worth a try! The watermelon was in a white plastic bag so that was what I was looking for. We looked around the bend but still could not see anything. However, a few metres further, out of the corner of my eye I spot something white! Could it be? Yes it could! Deep in the bushes was a white plastic bag! Patrick verified that there was a watermelon inside by poking the bag with a stick. We couldn’t believe it! The prodigal watermelon has been found! We were laughing so hard that our stomachs almost burst open. We couldn’t believe that we found the watermelon around the bend of the driveway deep into the bushes. That was one magic watermelon! After the watermelon fiasco, Shalom, Phebe, and I decided to hike Mt. Norman. The trail head was literally right next to our place so it was not too hard to find the trailhead. The hike up took us only 30 minutes and we were rewarded with great views of Bedwell Harbour and the surrounding islands. It was Patrick’s turn to make dinner that night and on the menu was baked steelhead fish stuffed with fennel and liquorice, brussel spouts/zucchini/onion skewers, grilled Portobello mushrooms and pineapples, and baked potato nuggets. And for dessert, we had the infamous watermelon. It was a meal to die for! After a hearty dinner, we all relaxed in the hot tub gazing at the stars, occasionally seeing the odd shooting star that Shalom boisterously pointed out. This morning’s breakfast was made by Sarah. She made Swedish crepes with delicious savory and sweet toppings. My favorite was the mashed apples and walnut topping. After a wholesome breakfast, we headed out and drove all the way to the end of South Pender Island to Gowlland Point to relax at the beach. I managed to get some good photos of sea otters. We wish we could’ve stayed longer but we had kayaking that afternoon. For lunch, we decided to eat out at the Port Browning Marina restaurant since we had a kayaking rental booked at 2:00pm. Although we got there early, we waited almost an hour for our food to come out. The service was really slow, probably due to the long weekend and the restaurant being short staffed. The food eventually arrived and we gobbled up our food very quickly so we didn’t miss our kayak appointment. Sarah and Patrick ordered a “small” plate of nachos but when it came out it almost filled half the table. I would like to see what a “large” order looked liked! Rumour has it that the double kayaks are also known as “divorce boats”. So the group decided to split up the couples for our kayak adventure. The pairings were Shalom and I, Roberto and Sarah, and Patrick and Phebe. During our two-hour kayak, we saw many sea creatures including starfish, crabs, and even a jellyfish! It was a nice, relaxing time out in the ocean. After the kayaking trip, we ended the long afternoon by hanging out and relaxing at Mortimer Spit. Patrick and I managed to skip some decent rocks that we found on the beach. For dinner, Shalom made a wonderful BBQ sausage, asparagus, corn, and baked potato dinner. She also brought some fresh greens from her garden for the salad. It was another awesome dinner. We relaxed in the hot tub again which ended another successful day. It was Roberto’s turn for breakfast and he made his favorite Colombian breakfast of boiled plantains with his special homemade tomato/onion sauce. There were also sausages, eggs, fresh avocado, and smoothies served. It was delicious and I hope Roberto will make this again in the future. That morning was spent cleaning up and packing as our check out time was 12noon. In the afternoon, we went to the south end tip of North Pender Island and decided to have lunch near Peter’s Cove for a beach picnic. After a late lunch, we headed to Sea Star Winery for some wine tasting. The art show at the winery was disappointing but at least the wine was exceptional. It was so good that we bought a bottle of wine to take home. We had extra time to kill before our ferry departure so we hung out near Port Washington and relaxed at the beach. When it was time to leave, we got to the ferry terminal pretty early. Near the dock we could see lots of orcas swimming in the ocean which drew a huge crowd of people. It was a successful long weekend trip to Pender and I look forward to coming back soon!